T. H. (Terence Harold) Robsjohn-Gibbings was trained as an architect and designer. Born in London in 1905, he was already well known in Europe for his contemporary furniture and interiors before he came to the United States in 1929. He apprenticed as an architectural draughtsman in London, followed by the study of architecture at the University of Liverpool and London University. He then held positions in various artistic fields in England prior to 1929. 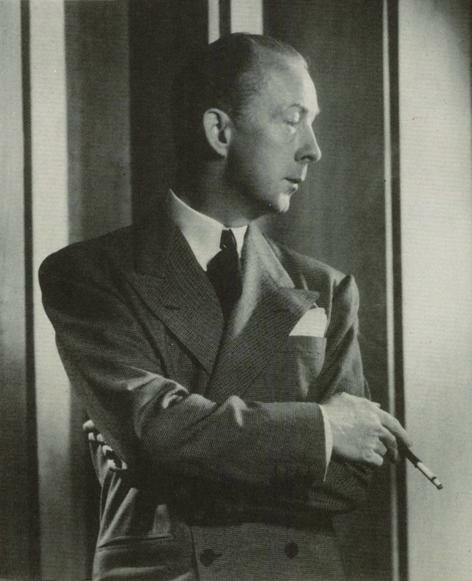 In New York he established Robsjohn-Gibbings Limited interior design firm, which he ran from 1936—1964. He was the sole designer for Widdicomb Furniture Co. from 1943—1956. Robsjohn-Gibbings’ most popular invention is the louvre drawer, which has been imitated wherever modern furniture is manufactured. Other innovations originated by Robsjohn-Gibbings include the strapped chair, the low standing lamp, and the glass top cocktail table. He was the author of Goodbye, Mr. Chippendale (1944) a spoof of modern interior design, Mona Lisa’s Mustache: A dissection of Modern Art (1947), and Homes of the Brave (1953). Robsjohn-Gibbings received the Waters Award for Achievement in Design in 1950, which was presented by Dale V. Ford, president of “David Wolcott Kendall Memorial School of Design.” Mrs. Dudley E. Waters established the award in 1949 in memory of her husband. Copies of the three books by Robsjohn-Gibbings are available at the Grand Rapids Public Library.